the second and last volume of his history of Jagdgeschwader 4 “Storming the Bombers, a chronicle of JG 4 – The Luftwaffe’s 4th Fighter Wing " and a new Luftwaffe Gallery 'special' devoted to JG 26 “The Abbeville Boys – JG 26”. 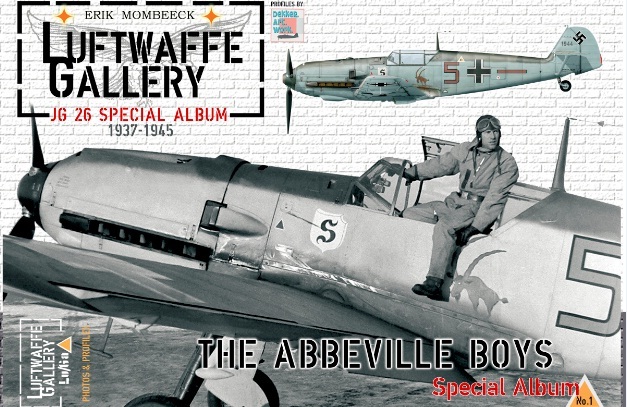 "...In our Luftwaffe Gallery series I am pleased to present this expanded 'special' edition devoted to JG 26, the famed "Abbeville Boys” or "Abbeville Kids” of RAF and USAAF legend. This super new title is a 96-page A-4 landscape format book with the emphasis on the finest photographic illustrations, exceptional artwork and new and exciting personal accounts. The heart of the book comprises some thirty high quality profiles drawn and painted by Thierry Dekker and a collection of rare and, in many instances, previously unseen photographs. The selection of new first person accounts, specially translated for this volume by Neil Page, provide an unparalleled view of air combat in the skies of Britain and France, from dog-fighting between Messerschmitts and Spitfires during the campaign in the West and the Battle of Britain, to fighter bomber missions over southern England, to the Allied invasion of Normandy and the desperate sorties flown by the unit's Fw 190s against the huge USAAF bomber streams...."
"..The concluding volume in our history of JG 4 covers the story of the Geschwader from Operation Market Garden in Holland during September 1944 to the final desperate battles over Berlin and capitulation in May 1945. 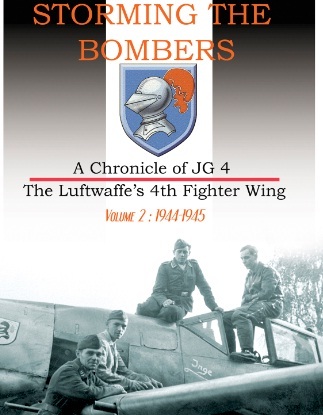 The combats flown by the pilots of JG 4 throughout this nine month period are related with the aid of rare oral testimony and illustrated with photographs from private albums, including a selection of new images for this English-language edition. Covered in detail are the 'Storm' missions flown by the Sturmgruppe (including ramming attacks against USAAF bombers), ground-attack bombing sorties during the Ardennes offensive of December 1944, the fullest account yet of the unit's participation in the 1945 New Year's Day Operation Bodenplatte, the last desperate sorties flown on the Oder front against the Red Army with, for the first time, accounts in English of German kamikaze attacks flown against the Oder bridges and the final air battles over the ruins of Berlin. Over the course of 20 years research I was able to track down and interview virtually every surviving pilot and compile their very often moving and desperate accounts into this book, giving it a uniquely human dimension which will undoubtedly be of interest to all former Allied aviators and their descendants as well as enthusiasts of the period. Once again Neil Page has produced the translation and his knowledge of both the French and German languages as well as WWII aviation history has enabled us to present this superb English language edition. The work is illustrated with several hundred photographs and is completed with loss and victory listings, a table of commanding officers and Thierry Dekker's superb full-colour profile artworks. This is an unmissable 232-page A-4 format hardback, with much new information on WWII air combat over Europe, the pilots and their machines.."